The critically-acclaimed The Legend of Heroes: Trails of Cold Steel series gets a HD remaster featuring 4K/60 FPS support, turbo mode to streamline gameplay, and for the first time on console, the option to play with the original Japanese voices along with approximately 50% extra lines of English voice-over dialogue. - Remastered with gameplay improvements - This PlayStation 4 remaster of the classic features 4K/60 FPS support, HD graphics, an optimized interface, and a brand new turbo mode to explore the map at 2x speed and battle at 4x speed. 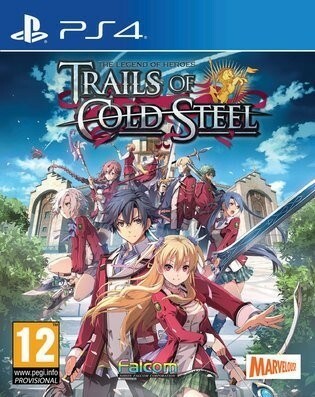 - A world rich in depth - The events of Trails of Cold Steel are expertly told so that longtime 'Trails' veterans and newcomers to the series alike can equally enjoy its detailed, highly nuanced storyline. - The 'Link System' adds depth to combat - Taking advantage of the Link System by bonding with allies throughout the school year will net a variety of combat benefits including better healing, guarding, and more! - Experience the game as never before - Original Japanese voices, as well as 50% additional English voiceover lines, and all DLC included from start; series veterans can also pick up and play from a previous PS3/PS Vita save.